In the Comox Valley, rubella the I-Hos Gallery is known as the place to go for authentic West Coast First Nation art. What started as an economic development project for the Comox Indian Band has become a unique venue for showcasing and revitalizing First Nations culture in the Valley and throughout Vancouver Island. In 1995, urologist the Comox Indian Band—now the K’ómoks First Nation—was looking to develop business opportunities on its Courtenay reserve and create job opportunities for Band members. 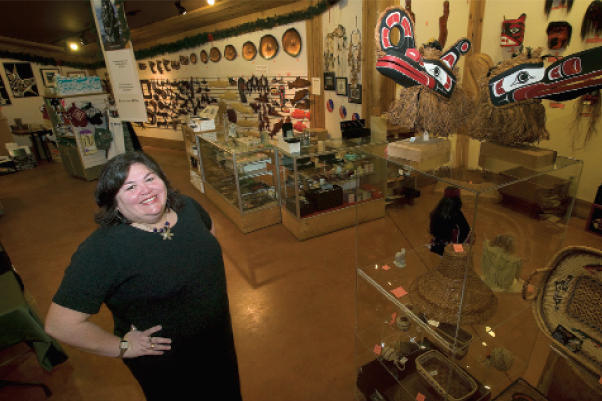 Then Band Manager Liz McLeod happened to meet Nancy Nightengale, a member of the Squamish Nation and owner of Kahot-la-cha Art Gallery and Gift Shop in North Vancouver. McLeod, along with community member April Shopland, decided the Comox Band could take advantage of the local tourism industry with a similar gallery on the reserve. They set out to make it happen with guidance and support from Nightengale. The I-Hos Gallery opened its doors in November of 1995 as a K’ómoks First Nation fully owned and operated business, with a mandate to promote and sell First Nations art. Staff quickly realized, though, there was a huge interest in—and substantial market for— local First Nations art, culture and history. “When we first opened, we tried dealing with all First Nations,” explains Ramona Johnson, Gallery manager, of the early days. That included artwork from First Nations artists throughout BC and Canada. “But after being opened for a few months we realized because of where we were situated our customers were coming to us for West Coast art. That and, “we had to educate people because they all thought we were Haida!” says Johnson with a laugh. The gallery shifted gears, and started educating everyone who came through the gallery doors about the artwork they were interested in buying. I-Hos produced maps showing the traditional territories of the Island’s three native cultural groups—the Kwakwaka’wakw on the northern and northwest coast, the Coast Salish on the southern and east coast, and the Nuu-chah-nulth spanning the west coast—and the many nations within these groups. The Gallery also developed text describing the differences in each group’s artwork. For example, masks and button blankets are a big part of the Kwakwaka’wakw culture, while the Nuu-chah-nulth have a tradition of bentwood boxes and cedar bark baskets. The Coast Salish are known for their woodcarvings with elaborate animal designs. The Gallery even hired Elders to share the legends and stories depicted in West Coast First Nations art. Johnson notes that the designs used in First Nation art are typically part of a family’s history passed on from generation to generation. “So the artist is not only sharing their talent, they are sharing a very big part of their family, their history and themselves,” says Johnson. Sharing the stories reinforces family lineages. In many ways, this sort of education is something only the K’ómoks First Nation could do. Present-day K’ómoks people are the heirs to both Kwakwaka’wakw and Coast Salish customs and practices. In fact, what is today known as the Comox Valley has always been a melding point for First Nations culture, whether through conflict, marriage or European contact. An ancestral chief of the K’ómoks people was even chosen to represent the interests of all Island First Nations to the European explorers and settlers. That understanding means good working relationships with all the artists who bring their work to I-Hos, and a vested interest in the product and the outcome. For her part, Johnson wants “our First Nations’ artists to be represented with the respect they deserve.” That means dealing directly with the artists, and buying their work outright rather than on consignment. Johnson also provides the artists with feedback from customers, and allows the artists to exchange their work for items more likely to sell. The result is artists who enjoy working with the gallery, so much so they often provide I-Hos with their best work. For people like Carol Sheehan, a Comox Valley resident, author and leading expert in Northwest Coast Art, it’s the relationship between the artists, I-Hos as a business, and the culture that makes the gallery so unique. Sheehan notes that many First Nation art traditions went into decline in the 19th and early 20th centuries when disease ravaged First Nations populations and government policy repressed traditional cultural activities like the Potlatch. Often the traditional holders of artistic knowledge died without having an opportunity to pass on their knowledge, or there was no one to take their place. It wasn’t until the 1960s and 70s that First Nations people interested in their own traditions and culture were able to look at the old art, reproduce it, and then start innovating. I-Hos supports the process of cultural rediscovery by teaching the traditions and providing a venue for those who are practicing those traditions to sell their work. “This is a place where First Nation youth can go into the gallery and sense the pride and sense the viability of the culture and where their own personal cultural identity is reinforced and enhanced,” says Sheehan. And that to Sheehan is absolutely vital. “That First Nations culture stills exists is a testament to the strength of the culture,” she says. “The fact that today we have a continuation of those histories is because of the resilience and strength of the culture to survive and to continue to be alive and viable and not to be extinguished in any way. Still, it’s the misunderstandings about contemporary First Nations culture that prove one of the biggest challenges to I-Hos staff.